In honor of my signing event tomorrow, I’d like to take the time to provide a PSA. I’ve been to many cons over the years and cosplay has evolved from the occasional Starfleet uniform to the body-painted, poly-foamed, uber-competitive, beautiful thing it has become today. 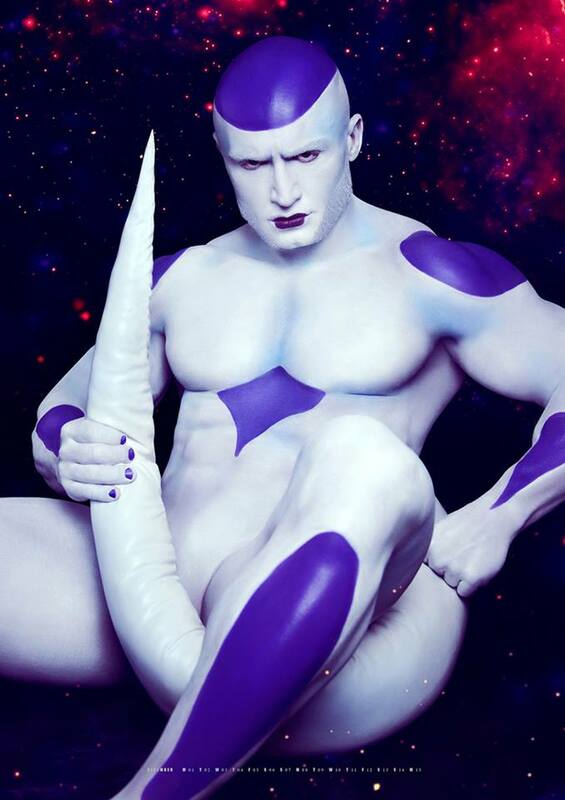 And while there is no wrong way to cosplay, there are some things people just don’t need to see. Ever. In the spirit of fair play, and to raise the bar for the competition tomorrow, I’ve got a few examples of things you might not want to do to impress the judges. 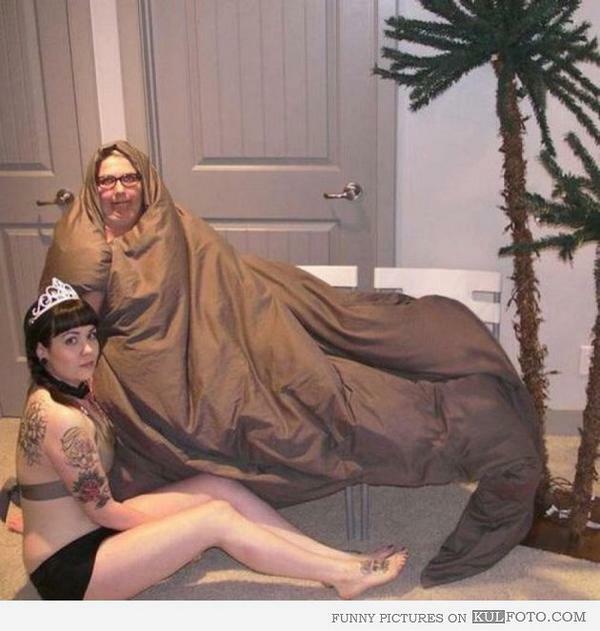 Re-enacting pivotal scenes in a novel, comic book, anime, or movie (such as the scene from Jabba’s barge above) is a great idea to sell a concept. Depicting the scene where Daenerys Targaryen, the mother of dragons, rises naked from her husband’s funeral pyre with her freshly hatched children can be tricky to pull off. Especially if you are in public. Or if you look more like her husband. This guy has a solution, but I’m not buying it. I get it. Having a tail can be awkward. Maybe you regularly knock your drink off the coffee table. Perhaps you’ve got to strap it to your leg so you don’t get slapped on the subway. And maybe sometimes you just sit down wrong and it pops up there and you struggle to restrain it while your Mom keeps trying to get the best picture for your website but she gives up halfway through, determined to rent out the basement to someone else, so you settle with this photo because, well, at least it’s in focus and easy to crop for the awesome space background you’d already picked to float around in. Sure, this is a superhero themed cosplay but… Awww, forget it – this guy wins. Danaerys needs a new shaving kit, and Wolverine’s butterfly mask is pretty awesome, but why did he stick his face in the cool whip? 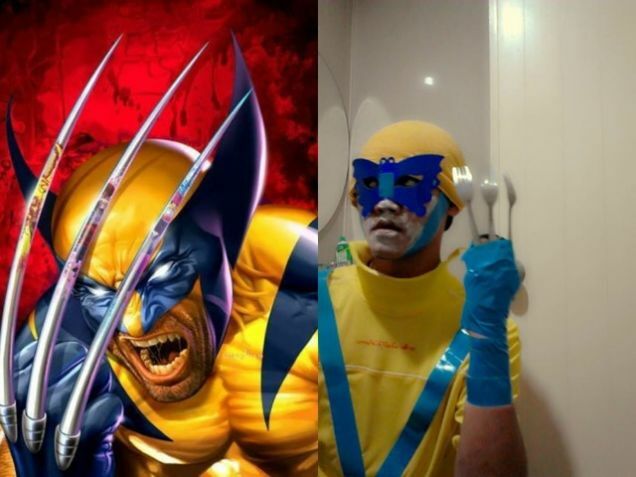 The last guy actually has a whole series of poorly done cosplay at https://www.facebook.com/Lowcostcosplay – some are more hilarious than Wolverine there, but, hey it was the right theme! He often does himself up in “whiteface”. I like to think it is witty social commentary, but yeah, could be a pie eating accident.